The Voice Kids of the Philippines Season 1 runner-up Darren Espanto holds his first major concert entitled “Darren Espanto D Birthday Concert” on May 29, 2015 at the SM Mall of Asia Arena in Pasay City. TV Host Robi Domingo, G-Force and Asia’s Got Talent Grand Winner El Gamma Penumbra were added to the list of guests aside from previously announced: The Voice of the Philippines Season 1 Champion Mitoy Yonting, The Voice of the Philippines Season 2 Champion Jason Dy and runner-up Alisah Bonaobra. El Gamma Penumbra is a shadow play group which was recently declared the grand winner of 1st Asia’s Got Talent (2015). The group not only impressed the judges: Grammy-winning producer/composer David Foster, Spice Girl Melanie C, Taiwanese star Vaness Wu and Indonesian singer Anggun but was also voted by the audience all over Asia. Tickets are available at P4,230 for VIP, P3,700 for Patron, P2,640 for Lower Box, P1,270 for Upper Box and P430 for General Admission at SM Tickets at 4702222 or smtickets.com. 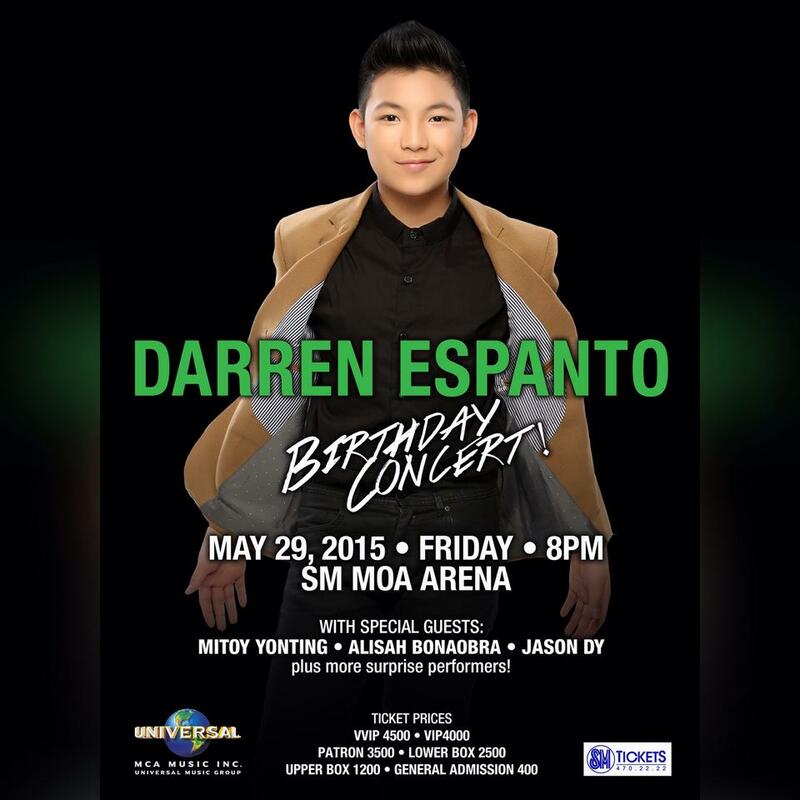 For VVIP tickets worth P4,760, contact Ms. Liza Ong through mobile - 09989741153 or through email - liza.ong@umusic.com. Darren Espanto D Birthday Concert is presented by Talk N’ Text, Spinnr and MCA Music in cooperation with Brood Shoes distributed by Sports House. Special thanks to MUM Make-up Madness, Bangs Prime Salon by Tony and Jackey, Aficionado German Perfumes, C3 Events Place, Cravings, Clarence, Erase Certified Beauty, Eton International School and Placenta. With media partners: ABS-CBN, MYX, MOR 101.9, 106.7 Energy FM and Mellow 94.7. Darren, the album is now out under MCA Music (Universal Music Philippines) on CDs at Astroplus and Odyssey outlets. You can download Darren’s album on spinnr.ph.